I have a chili recipe that I typically stick to but always like to try something new. This one looked like it would be a good one for me but something just didn't quite hit the spot with this one. I'm thinking it was probably the Borlotti Beans - I'd much rather have used kidney beans. Also I added more spices as I felt there just wasn't enough seasoning. A friend who shared this with me, and is a big foodie, LOVED it so you likely will to if you want to give it a go! 1. Wash and dry all produce. Thinly slice scallions. Mince or grate garlic. Drain and rinse Jack's borlotti beans. Core, seed and remove white ribs from poblano pepper. Cut into 1/2-inch squares. 2. Heat a drizzle of oil in a large pan over medium-high head. Add ground beef and break into pieces with a spatula or wooden spoon. Cook until crisped at the edges and no longer pink, 5-6 minutes, stirring occasionally. Season with salt and pepper. Remove from pan and set aside. 3. Remove pan from head and carefully pour out and discard any oil left by beef. Return to heat and add scallions, poblano and garlic. Cook until lightly browned and softened, about 6 minutes, tossing. 4. Add chili powder and cumin to pan and stir to coat vegetables. Cook until aromatic, about 30 seconds. Season with salt and pepper. 5. Stir in stock concentrate, Jack's borlotti beans, crushed tomatoes, beef and 1 cup water. Let bubble until thick and saucy, about 10 minutes. Season with salt and pepper. 6. 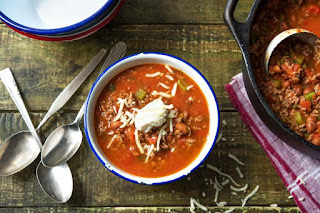 Divide chili between bowls. Sprinkle with cheddar cheese and sour cream. I don't like scallions so I think it would've been better with yellow onion and I think more chili powder could've been used, but I like my chili SPICY! Enjoy and if you try any of these recipes be sure to let me know how they came out!